What Makes Troy Lighting Fixtures So Special? When it comes to lighting fixtures, most homeowners are looking for pieces that look amazing, will last a long time, and won’t break the bank. With these qualities in mind, Troy Lighting has crafted an incredible line of fixtures that are perfect for any home and decor choices. 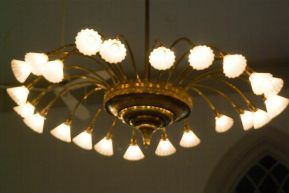 It is why Troy Lighting chandeliers, sconces, and other pieces have become so popular. Established in 1063, Troy Lighting has been creating beautiful and unique lighting fixtures for homes and offices for over 50 years. They arrived on the scene with a commitment to “the pursuit of excellence, a design-driven culture, attention to ever-changing environmental considerations, and commitment to the highest possible quality.” You can see this commitment in every single piece that they create, from their gorgeous Troy Lighting chandeliers (http://blog.crescentharbor.com/seven-reasons-people-like-troy-lighting-chandeliers-sconces/) to their simple and stunning sconces. But what makes their chandeliers so popular? Here are a few reasons why people are choosing Troy Lighting for their most commanding lighting fixtures in their homes. While many types of lighting fixtures exist to provide light and blend into the decor, this is simply not the case with a chandelier. Commanding, beautiful, and central fixtures in any decor scheme, chandeliers need to make an incredible first impression. Troy Lighting chandeliers take this idea to beautiful limits with unique and gorgeous designs that command attention. Troy Lighting chandeliers are not only gorgeous and able to stand the test of time, but they are also incredibly beautiful pieces that almost anyone can afford. It is part of the company’s commitment to quality and affordability, and their pieces have a wide range of pricing to suit the needs of individual consumers. So if you are looking for a simple-yet-elegant piece for your dining room, or for a commanding chandelier for the front entryway, there is a piece for you in their collection. And it won’t break the bank. When most people think of chandeliers, they think of imposing metal pieces often accentuated with glass. Troy Lighting chandeliers, however, are adventurous in their designs and materials, ranging from imposing and gorgeous wooden designs to contemporary takes on the familiar. If you love the rustic stylings of a wooden piece, there is a wide range that combines with other materials for something completely different. If you are a fan of the contemporary combination of chrome and black, you can also find a wide range of pieces. If this line of chandeliers has a defining characteristic, it’s the willingness to use the unconventional to create pieces that feel familiar yet look entirely new. Troy Lighting has been creating unique and beautiful lighting fixtures for over 50 years, combining an adventurous style with a willingness to create beauty that fits any budget. If you are looking for your next chandelier, be sure to check out our line of Troy Lighting chandeliers. There will be something that fits your space, décor, and budget, and it will command attention for years to come.